In less than 24 hours, an E-petition to the federal government calling for the return of treaty cards has received more than 130 signatures. 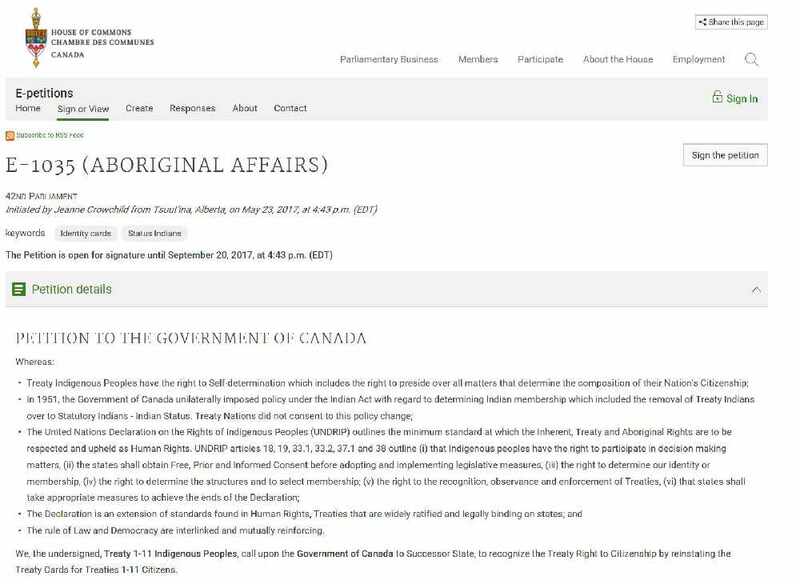 The petition was put forward by Jeanne Crowchild, who works in the Tsuut’ina Nation’s treaty initiative office, and sponsored by Abitibi—Baie-James—Nunavik—Eeyo NDP MP Romeo Saganash. There’s an important distinction to be made between status cards and treaty cards, said Crowchild. In 1951, the Indian Act was unilaterally amended by the government changing Treaty Indians to Status Indians. That single action, she contends, removes Treaty 1 thru 11 members from their connection with the land. “I want to help our people move forward, and tie us back to the land. I think this is a major first step. I really do in my heart. If we can get that, then everything else will fall in place,” said Crowchild, who worked with her mother Regina Crowchild on the petition. Among the actions she hopes will “fall into place” is Prime Minister Justin Trudeau dealing with First Nations independently and defining his concept of “nation-to-nation” relations. There needs to be an understanding, says Crowchild, that negotiations happen with each band and that organizations like the Assembly of First Nations – which represents all 634 First Nations in the country - do not speak for the bands that comprise Treaty 1-11. Crowchild points out that 54 per cent of Canada’s land base is under Treaties 1-11, comprising approximately 230 First Nations and there is no organization that represents only this group of First Nations. Introducing the E-petition was Crowchild’s way to acknowledge that talking was through and action was needed. For the petition to be debated in the House of Commons, 500 signatures are required. Crowchild says the house would have to address the fact that Status cards are no longer wanted. Status cards expire, she points out. Treaty cards do not. Crowchild has emailed information about the E-petition to all First Nations in the country. The E-petition will remain open for signatures until Sept. 20. Crowchild points out that by September 2050, there will no longer be any Treaty Indians, as that will mark 100 years since the last Treaty cards were issued. “Their game plan is to assimilate us into the mainstream society,” said Crowchild. Crowchild says she connected with Saganash through mutual friends. “He was in full support,” she said. Saganash’s constituency office said the MP was in his riding for the week and had limited access to telephone communication, so couldn’t comment on his decision to sponsor the E-petition. This marks Crowchild’s second shot at introducing the E-petition. She tried about six weeks earlier, but her attempt was thwarted because of the words used. Crowchild worked with the administrator to get this petition written correctly and successfully introduced on May 23. Crowchild says she followed protocol discussing the petition first with her Elders, next with her working group and finally receiving the blessing of chief and council. Right now, she says, the Treaty 6 and 7 Indigenous technical team she works with is in discussion over the next steps to be taken “when” the E-petition passes in the House of Commons.